I used to hate mushrooms. (I used to hate a lot of things, apparently.) I would flip if I found an occasional mushroom on my pizza or in a salad. “They’re rubbery, slimy, and gross!” Dude. How could I have been so wrong? The first time I had these I was at our friends’ wedding. It was a beautiful, classy, and dare I say it, foodie friendly wedding. So much food, and five different kinds of cake!! 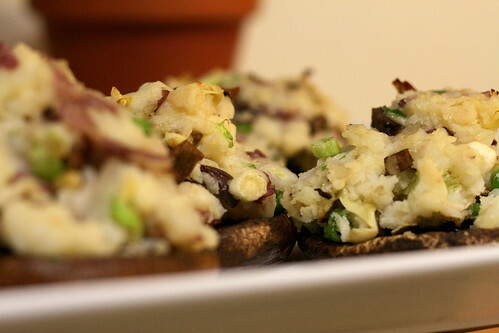 I tried the stuffed Portobello mushrooms paired with roasted vegetables and white wine. My mouth is watering again, sorry. That wedding was this summer, and I’ve had these on my mind ever since. I knew I could make them myself, but for some reason I had it in my head that my family wouldn’t like them, and I’d have to find some sneaky way to convince them to eat these for dinner. I’d see them in the store, think about it, but then put it off and forget for awhile. And then we happened to be standing next to the mushrooms one day, and Nick just picked them up and put them in the cart. No discussion, no convincing, just nestled right in between the onions and sweet potatoes. And he claims we don’t like the same foods. 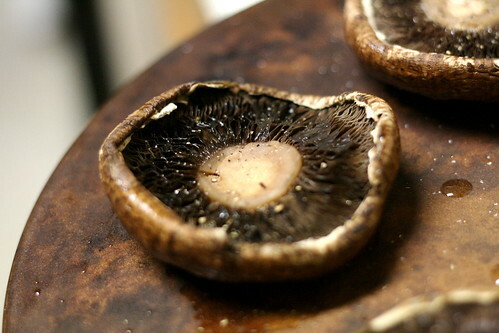 Mushrooms, stems removed, brushed with olive oil. You can use a spoon to remove the gills, but for some reason we didn’t find it necessary. 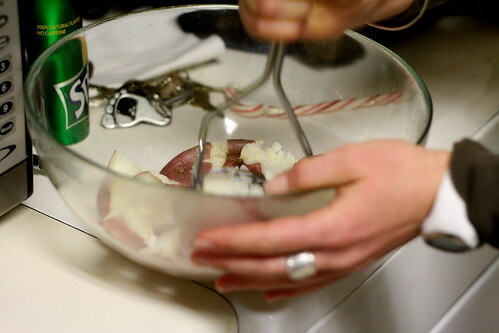 Red potatoes, cooked in the microwave. I put them in the microwave, she mashed. We made an excellent team. Freshly grated cheese rocks my brightly colored socks. (Teehee) We went with something a bit salty, and it worked out really well. 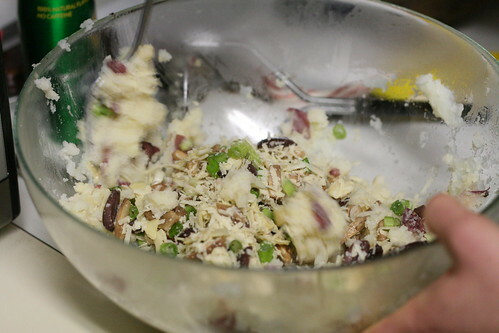 Here are the mashed potatoes mixed with green onion, kalamata olives, grated cheese, garlic, chopped artichoke hearts (from a jar), salt and pepper. 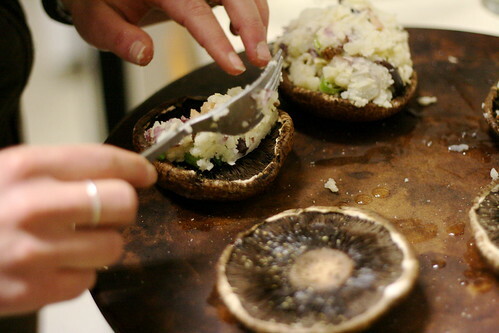 The mixture was spooned over each mushroom in heaping piles. Even still, we ended up with a little bit of extra filling. I just made a tinfoil pouch and cooked it with the mushrooms, and we served it alongside dinner. These went into the oven at 350F, and it took about 20-25 minutes. 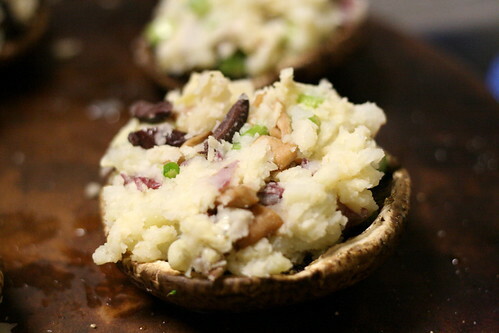 Enough to make the tops of the mashed potato mixtures golden brown, and the mushrooms very tender. Admittedly, the mushrooms get overwhelmed by the stuffing and you can barely tell that they’re under there. Until you take a bite! The mushroom flavor doesn’t overwhelm your taste buds, but you know it’s there. 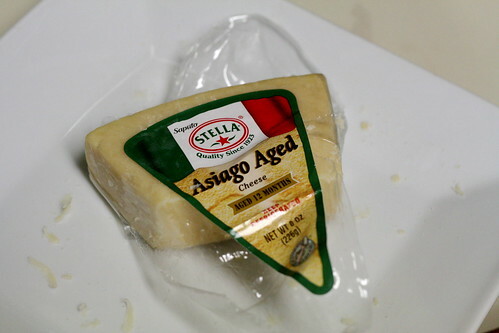 It’s tender and juicy, and the salty cheese and tangy artichoke hearts give it a kick. I know that my sisters are reading this, and if they’ve made it this far in the post, I’m quite proud of them! 😉 (I come from a long line of mushroom haters) But don’t just read this, try it! You might become a convert, like me. And if you make these for your friends (or they make them for you), don’t forget the chef hat. 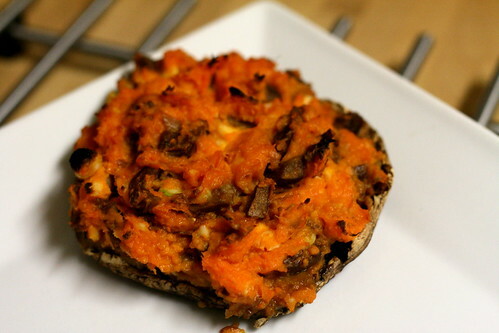 I remade this dish using sweet potatoes and feta cheese, and it was AMAZING!!! I could eat it every day of my life and be a happy lady. It may not look pretty, but if looks were everything…you know the rest. Done! I can’t believe I didn’t know you like mushrooms. I like mushrooms but had so much trouble feeding them to the family I finally gave UP! Glad to find out you both like them. Can’t wait to try this one for myself! Oh, that does look delicious! 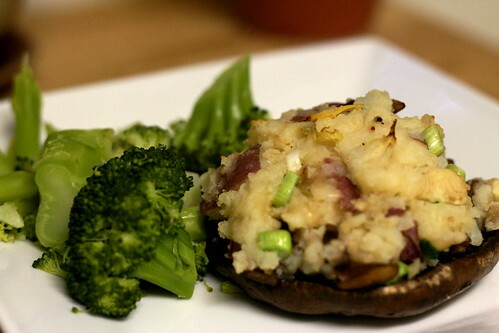 I’ve been wanting to incorporate more mushrooms in our diet and this looks perfect. Now, to figure out how to manage it on my £30 a week grocery challenge! hmm.